Lynx RDA By Digiflavor Review - Daily Vaping Deals & The Best Vape Product Reviews at Vaping Cheap! Digiflavor have come on strong with their offerings to the Vape market this year. The release of the infamous Pharoah RDA dripper tank saw some ingenious design initiatives and machining quality. Today we will be focusing on the Lynx RDA, supplied by Heaven Gifts for review. The initial similarities between the Lynx and the Pharaoh Dripper Tank are the spring loaded, goon style build deck and the very well thought out catch cup in the roof. The rest of this RDA is unique in it’s design and presentation, loaded with even more innovation to which we have not yet seen in the game. More on that to follow. The Lynx is a 25mm RDA available in both brushed stainless and black color options. We find a 2ml juice well in the body which sits at 26mm tall without the driptip. It features a Goon style, dual post, build deck with top mounted screws and spring loaded post clamps. The airflow is totally adjustable and can quickly be configured as bottom airflow only or bottom and side airflow. A delrin drip tip is included along with a 510 drip tip adapter which enables you to utilize your favorite 510 tip. Use Coupon Code ACHEAP15 for 15% off Purchase! Click Here to Check Out the Digiflavor Lynx RDA! Digiflavor doesn’t mess around with packaging. Their product line so far comes in neat, sturdy and well-presented boxes. There is no excess space wasted and each box has enough padding to house the tanks without damaging them in transit. My first impressions were that it was just a solid unit with no airflow in sight, and then I noticed a seam in the middle. I twisted the top cap gradually and looking very carefully i saw that there was a channel on either side with slots slowly presenting themselves. Further twisting revealed that there were side airflow slots as well. It took some time inspecting the Lynx to finally realize exactly how the airflow system works and how to get it operating. In short, from being fully closed, you twist the top cap until the desired amount of airflow is reached. There is no side-only airflow option; it is bottom only or a combination of bottom and side airflow. The bottom airflow works by air entering thru the channels on either side of the body, then travelling down underneath the juice well to a port that sits directly under each coil. The side airflow hits directly onto the side of coil – purely as you would imagine it to. 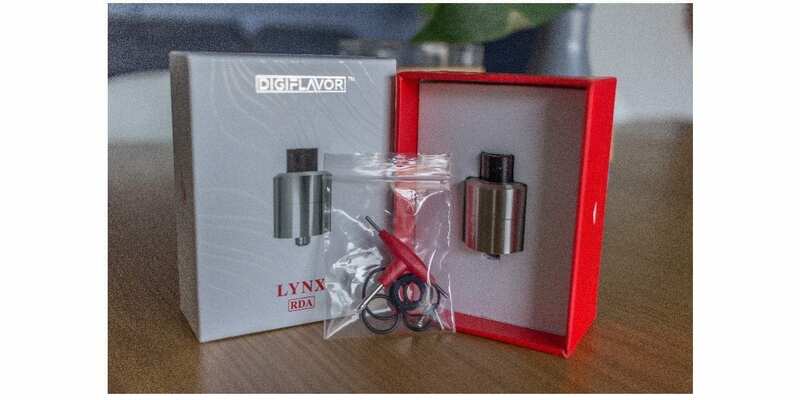 Digiflavor markets the Lynx as adjustable bottom airflow for Mouth to Lung style vaping with robust flavor. And adjustable side airflow for Direct to Lung style vaping used in conjunction with bottom airflow for more vapor. The machining is of a high standard, with no janky parts or loose metal filings and smooth threading. It breaks down into 3 separate distinct pieces. The base which houses the build deck and 510 connection, the bottom half of the chamber housing the airflow channels and male threading, and then the top chimney section which has the female threads, the catch cup in the roof and the drip tip cavity. On inspection, there was no obvious sign or smell of machine oil, however there was a small deposit of what seemed to be VG. A quick wash in hot water and detergent cleaned everything right off. The o rings ensure everything fits together snug and seem to be of high quality. The positive pin appears to be either gold or gold plated and can be adjusted if required. The Lynx looks good on every box mod I tried it on and does not sit too high or leave any gap between it and the mod. The spares bag contains enough o rings to cover any replacements that could be needed from general wear and tear. Although there are no allen key adjustments needed on the Lynx RDA, the tri tool that ships with this unit will come in handy for any other tanks that require it. This means you only need to take this one tool with you in your kit, keeping your travels nice and compact. There is a screw on the base of the RDA that appears to be located right underneath the negative post. Initially I presumed this would be to add a bottom feeder option for squonk type setups, however most BF attys are fed through the positive pin. There is no mention for the use of this screw, it may be for maintenance. Let us know if you know what the purpose is in the comments below. The spring loaded post clamps are a dream to build on with enough room for larger diameter wire. The fact you don’t have to awkwardly lift up the post clamps while you’re trying to install your build is a winner. The edges of the post clamps have locators, so the wire doesn’t slip out before you screw it down. Be careful not to back the screws out all the way because the spring mechanism will pop right out and runs the risk of never being found again. If you really do want to find out how much room you have to play with, be very careful when taking these out because there are no extra springs included in the spares bag. The post screws attach vertically from the top, screwing downwards. I personally like the Philips style screws on the post clamps as they do not seem to strip as easily as hex screws. By the way, all of the Digiflavor attys are shipping with the tri tool that covers both Allen keys and Philips head scenarios. The deep juice well enables you to drip a fair amount of e-liquid, equipping you for multiple hits without having to constantly drip. The amount of hits you get and amount of liquid you can drip obviously depends on your build, wicking and temperature settings. The 510 drip tip adaptor sits flush to the top of the atty and does not stick out like the many adaptors for other attys. 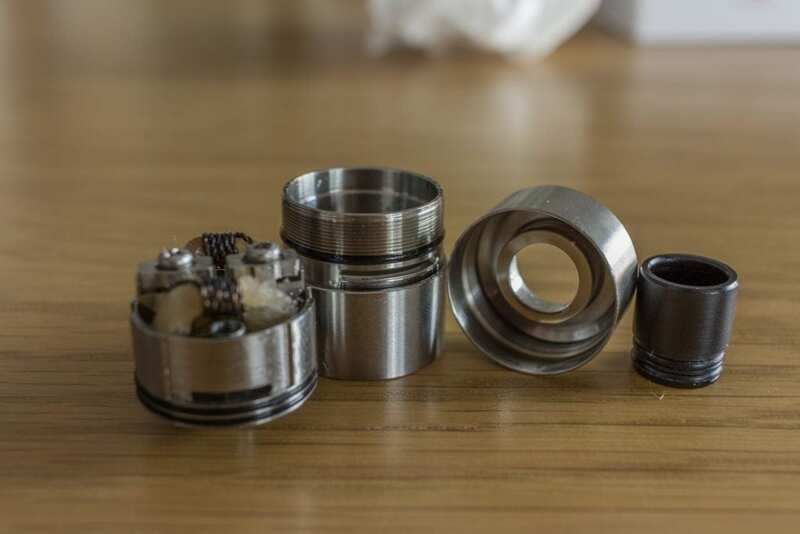 So your 510 drip tip of choice looks in place, not like an add-on. 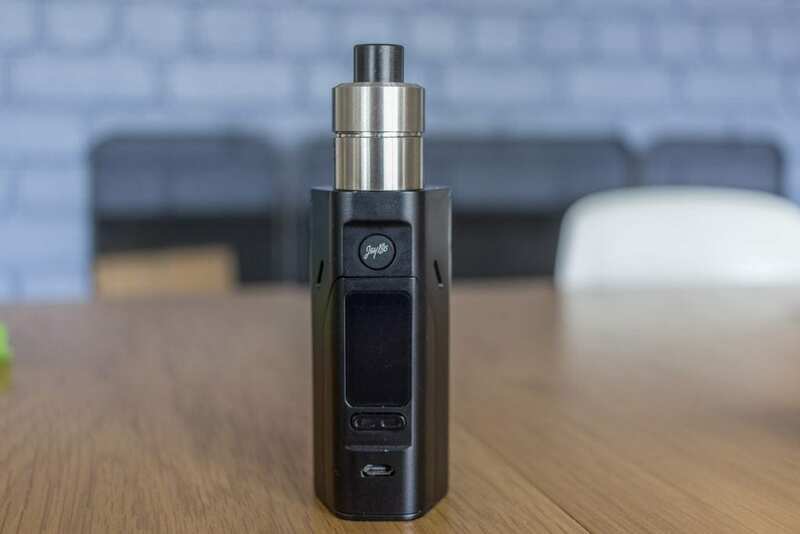 A handy feature of the included drip tip is that you can drip directly down the center, onto the posts, without having to remove it or the top cap. Initially I tested the Lynx RDA with my standard go-to build of SS316L Dual Claptons, 26/32 AWG 6 wraps at 2.5mm diameter. This build normally comes in around 0.3 ohms and it did exactly that in this instance. It was a breeze to fit into the posts, clip the ends off and get wicked up. I primed the coils, screwed the top cap on and proceeded to drip 10 drops straight down the middle of the drip tip. For my initial vape on this RDA, I chose to have the side airflow just barely open a whisker – relying on the bottom airflow. At 60 watts, I had my first pull and I was impressed straight away. Full on flavor! I gradually went up to 75 watts, opened up the side airflow a little more and found that to be the sweet spot for this build and RDA combo. I was getting great flavor and a generous amount of vapor production. Wow, I was digging this atty in a big way. Okay, it was time to test the Lynx RDA out to its full capabilities. I opened up the side airflow to almost fully open and started climbing the watts up gradually to 90 watts. The vapor production I was getting at this stage was staggering. Taste did not lack as I was climbing up the wattage, however I had to drip more often as the wick dries out quicker. I have to say the top cap obviously does get hot at the higher temperatures, so watch your lips – especially if your chain vaping. The ability of being able to tailor the airflow so quickly and adjust the wattage to suit my desired vape is very enjoyable and satisfying. Whether you want a cool and refreshing hit or a hot and dense vape, the Lynx RDA can provide. The other builds I have tried in the Lynx are twisted combo coils, standard and spaced regular coils and some parallel coils. All were a cinch to install and performed as expected, giving great flavor and vapor production. Temperature control works flawlessly so there are no worries for those who like to utilize TC capable builds. I have not experienced any ohm jumping or irregular behavior while vaping on this beast. One recommendation I do have is to put some juice on both the side and bottom o rings. This makes turning the airflow and getting the top cap on and off easier and eliminates the squeaky noise when adjusting airflow. There is a noticeable whistle when using predominantly only the bottom airflow; however this goes away when you start to engage to side airflow. I have not experienced any leakage at all with the Lynx RDA. The ability to be able to close off all of the airflow for transport is ingenious. And if you happen to knock it over or lay it on the side, there is a catch cup in the top of the chamber that will prevent juice from leaking out. When put back into a vertical position, the juice runs back down the walls of the atty onto your wick or into the well. 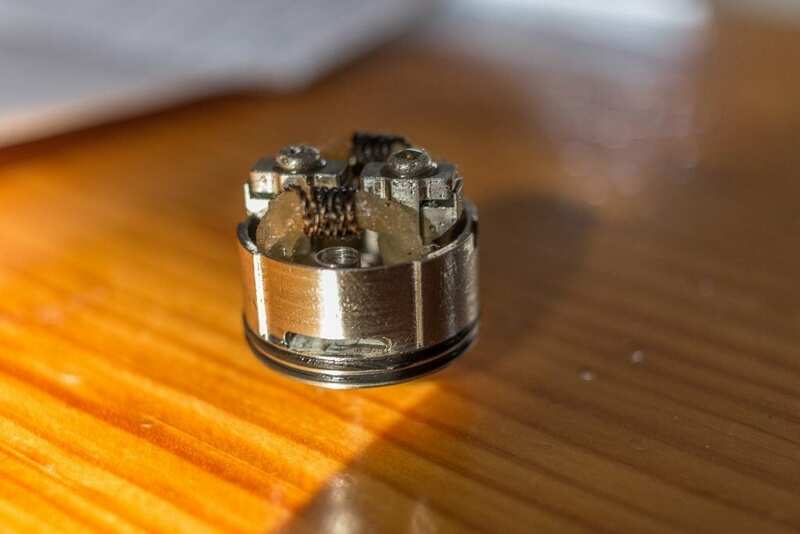 Theoretically if you over drip or happen to drip into the airflow holes under the coils, the juice should run back up the airflow channels and into the deck. I assume gravity would assist this process when you take a pull on it as there is literally nowhere else for excess juice to leak out. The cons I have with this unit are the fact that the airflow system does not accommodate for a single coil option, unless you manually modify and block the channels on one side. And depending on how open you have the airflow, the top cap can be a little wobbly as there are fewer threads holding it on. The unit does not ship with spare springs, so care needs to be taken while taking the mod apart and cleaning it. It would have been great to see an anti-spit back drip tip option as per the Pharaoh. This would have been an easy and cheap add on to the Lynx RDA. The whistle when only employing the bottom airflow could get on some peoples nerves, however it didn’t bug me too much. In summary I have to say hats off to Digiflavor for bringing innovation and contributing to developing the way we vape even further. The Lynx RDA was well thought out in both design and usage. The new features this atty brings definitely unlocks new potential for the way we do things. It works as advertised and it does its job very well. I have no hesitation in recommending this RDA to anyone who is interested.